Q: How far ahead of pickup time should I place my reservation? A: Chauffeur availability can be guaranteed 2 hours in advance. Reservations less than 1 hour before the pickup can be made but a Chauffeur may not be available. Nonetheless in this instance, Triple 8 Corporate Cars will make the best attempt at providing you with a Chauffeur. Q: How do we find a Chauffeur after our flight arrival? A: Domestic Qantas flights – The drivers wait at the Meeting Point which is located down at Carousel 3. You will see the drivers holding signs and waiting to make contact. It is important that you make contact with the driver before you head off to the carousel and get your bags. Domestic Virgin Flights – When you arrive in Melbourne Airport you come down the escalators. The drivers are in front of you as you are coming down the escalators. International Arrivals – When you have cleared Customs and walk out into the terminal you walk out to the right. You will see a Travelex counter that is the meeting point for the international travelers. Under any circumstances you cannot find your driver please call us on +61 (0) 402 339 953 and we will make contact with your designated driver. Q: How long will the Chauffeur wait for us to clear customs once the plane has landed? A: Once the plane has landed, the Chauffeur will wait for 30 minutes at no extra charge. The Chauffeur will then wait another 30 minutes making it a total of 1 hour, but will charge the standard rate for the waiting time. After 1 hour the credit card will be charged at the full rate plus waiting charge. Q: At what point during the service is my credit card charged? A: Once a booking is made, the credit card details are held as security. Upon completion of the journey the credit card will be charged. (there is an 11% service fee on all credit cards). Q: Do you have baby seats and boosters available? A: Yes we do. We understand that people want to travel as a family and spend quality time as a family. We offer baby seats and boosters as part of our service. Each chair is charged at $10.00 a seat. Q: Do you provide cars for late evening transfers? 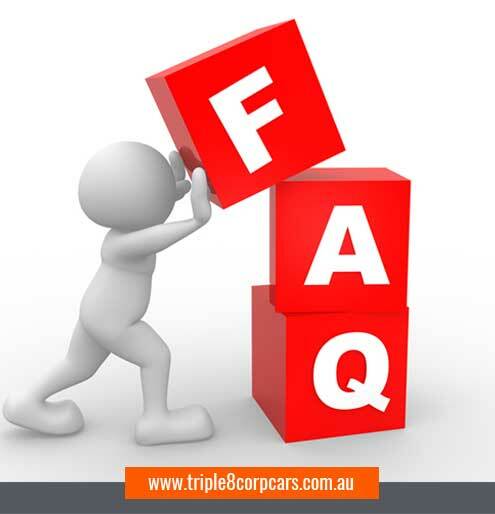 A: At Triple 8 Corporate Cars in Melbourne we provide a 24hr, 7 day service all year round. With transfers between 11:30pm in the evening to 5:00am in the morning automatically incur a 30% surcharge on top of the total price. Also the 20% surcharge applies on these days – Easter Saturday, Sunday Christmas Day and Boxing Day. During special events in Melbourne different prices apply such as – Grand Prix, AFL Grand Final, Spring Carnival – (Melbourne Cup), Australian Tennis open. Q: Are East Link tolls included in the price? A: East Link tolls are not included in the price and will be added if used.